If your planning on visiting Germany for Oktoberfest your going to need to pack the right attire. This means guys bring your Lederhosen and lady's bring your Dirndls. Leaderhosen are the traditional attire for working men in Bavaria that date back to the 18th century.They are characterized by their leather shorts, suspenders, and braces. Dirndl on the other hand, are tradition garments warm by the women of Bavaria. They consist of a bodice, blouse, full skirt and apron. Dirndl in German refers to a young women or girl and the material of the dresses are made of thick cotton, linen, velvet, or wool. 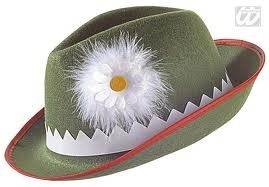 A Tirolerhute is a traditional gentlemen's hat from Bavaria and believe it or not it says a lot about you! Each Tirolerhute has a tuft of goat hair attached to it. The goat hair signifies how wealthy you are considering goat hair is highly valued in German Society. The more tufts of goat hair on your hat means the the wealthier you are and the more beers you can afford your friends! Step 3 Handle Your Alcohol! German authorities report a rising number each year of young adults not being able to handle their alcohol. Apparently, many forget that Oktoberfest beer is brewed with a higher alcohol content (5.8%-6.2%) than regular German Lagers averaging 5.2% in alcohol content. Also, the sugar content is much higher in Oktoberfest beer, which can directly correlate with a nasty hangover! 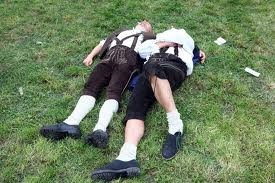 Germans call drunk Oktoberfest patrons that cannot handle their alcohol "Bierleichen," German for "Beer Corpses." Bring your one liter steins! Yes, I said 1 Liter!! Germans typically drink out of 1 liter steins during Oktoberfest. These steins date back centuries to the black plague, where government officials made it mandatory to have covers over drinks to prevent the spread of disease! Nowadays, most Germans have traded in their ceramic steins for a more modern glass stein. Keep these four steps in mind when considering Oktoberfest! If you are looking to sample fine German brews among other country's beers check out this website that allows you to do just that (The Microbrewed Beer of the Month Club)! And Always, Never Drink and Drive!